Our young hero, Michael Gergen, has decided on the advice of his former teacher, Obi-Brett Hullobi, to seek out a Jedi Master on a remote planet. Upon arriving on the planet, he crashes his flying zamboni and is stuck in the swampy muck. He meets a strange creature who hops around wildly, stealing food from him and banging on his android companion. Michael gets frustrated and complains about being stuck on the horrible slimy mudhole of a planet. The strange creature takes offense. Michael feels a little badly for insulting the little green fuzzy man’s home. He is reminded of another little guy with fuzzy hair, Mike Connolly, and feels a little homesick for Duluth. So he sits down and has a meal with the little green guy, hoping he’ll take him to the Jedi Master. Eventually he runs out of patience and demands to see the Master. The little green man’s demeanor changes entirely, and he sounds weary. 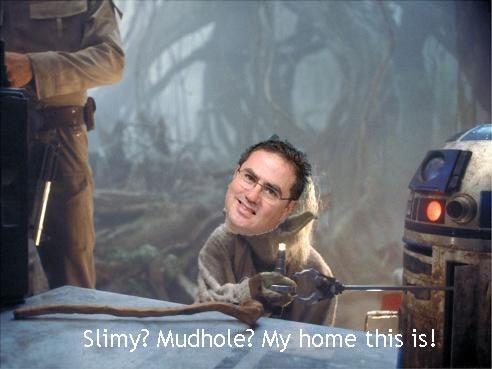 Suddenly the disembodied voice of Obi-Brett Hullobi boomed out over the swamp. “Was I any different when we were teammates?” Gergy realizes that the crazy green man is actually Jedi Master Bill Watson, the very being he sought out. Watson and the voice argue for awhile and then after about 10 highballs they are reminiscing about the old days and the master agrees to take on the young Jedi Knight. He warns him, in a voice that slurs every third word, that the training will not be easy. Jedi Master Watson passes out and Michael goes and works on some statements of cash flows for his accounting class. The days pass and the Jedi training intensifies. 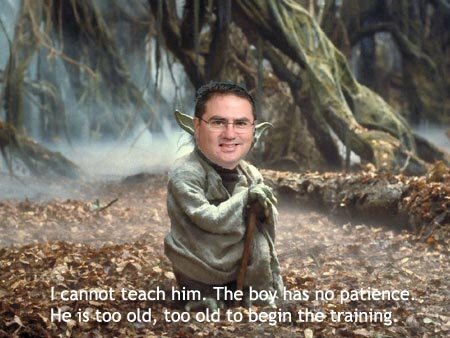 Jedi Master Watson passes on his wisdom, but the young knight is still full of questions, wanting to soak up all that he can of the master’s knowledge and experience. 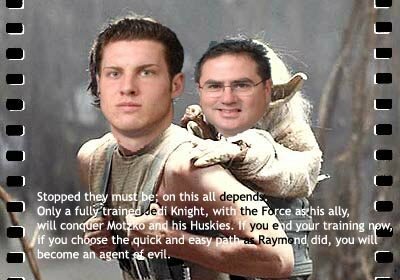 But with his growing knowledge of the force, young Michael can sense trouble for his fellow Bulldogs. 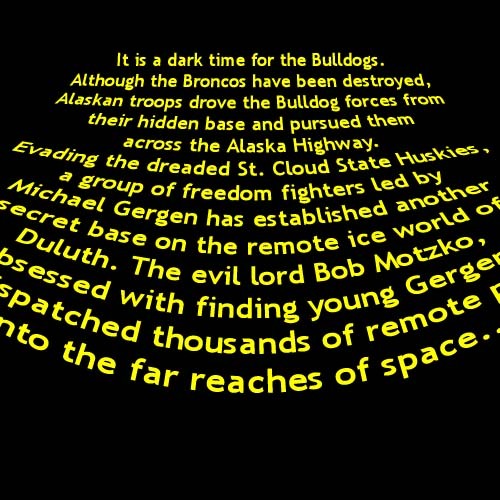 The evil sith lord Motzko and his pesky little Huskies have threatened the Galactic Empire. His Bulldogs are in trouble! They need him! But he also needs to finish his training. Master Watson wants him to stay. Michael decides to leave anyway, because he knows that he can use at least some of his skills to fight the evil Motzko and his vile henchmen. However, his flying zamboni is stuck in the muck and he can’t get it out, no matter how much he tries to use the force. “I can’t,” he says, panting, “it’s too big.” Jedi Master Watson shakes his head. “Size matters not. Look at me. Judge me by my size, do you? Hmm? Hmm. And well you should not. For my ally is the Force, and a powerful ally it is. Life creates it, makes it grow. Its energy surrounds us and binds us. Luminous beings are we, not this crude matter. You must feel the Force around you; here, between you, me, the hockey stick, the puck, everywhere, yes. 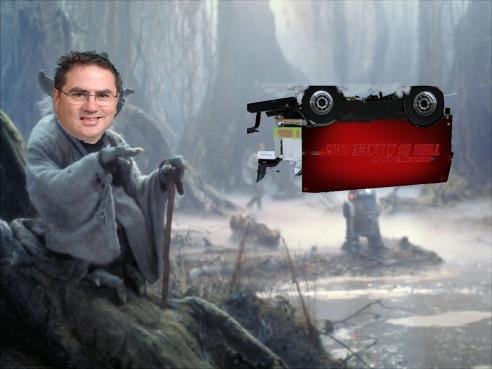 Even between the land and the zamboni.” Michael still looks skeptical, because Jedi Master Watson is very small and green and fuzzy, so the master has to put his badasssss mad skillz into effect. He lifts the zamboni out of the swamp. What will happen to our young hero??? And the Bulldogs??? Stay tuned for the next installment! >Perhaps if you had picked tDogs they would have won. I STILL BLAME YOU!!! Hee.Also, I don’t live in Duluth, I live in the Cities. According to Dirty, hotel rooms are scarce up there that weekend! >you have faaaaar too much time on your hands, my dear! ahhhh, bill matson and brett hull! those were the good ol’ days! hope you had a good birthday…love mom! >You are a true geek. Nice Star Wars post. I’ve never watched the movie so I didn’t get 99% of the post. Oh well! >I do like the photoshop stuff though! >I always want the cheese.From 12:08 of the 2nd period in Friday’s game, until 2:29 into the 2nd period of the Saturday contest, UMD had the penguin whammy working. That’s 50 minutes and 21 seconds of continuous game time during which UAA was whistled for 8 minor penalties and during which the UMD bad doggie kennel stood eerily empty. UMD scored 3 of their 4 goals on the weekend during those 50 minutes, all PP tallies. They had another apparent PP goal in that interval disallowed because of goalie interference.5-car pile-up hockey does produce individuals having some down time on occasion, so my perception was delayed. What alerted me to “the force” being applied was an inexpiably weak tripping call aginst UAA midway through Fridays 3rd period. On Saturday I was alert and noted a clear trip, then a flagrant slash to the biceps near the UMD penalty box, in the 1st period by lip-sticked, overly jowled individuals that went unpenalized. Well, being alert really wasn’t necessary because the infractions were more visible than a supernova to any observer in the galaxy.The really clever thing was splitting the application over two games. That, and being willing to accept that space/time can only be stretched so far, even with Don Adam in it, and cause and effect cannot be suspended infinitely. Arranging the food poising of several ’Wolves on Saturday wasn’t so shabby either.Well, your next opponents are the bunch I hate on most, so oil the android and fill the propane bottle. >While your conspiracy theories are certainly not unwelcome here, they would perhaps be better left on a different post. Like the Space Oddity one before.THIS post is about the epic struggle of Michael Gergen to become the Jedi Knight/hockey player he was destined to become and how he is battling to realize that destiny. Not about using Jedi mind tricks to keep the refs from seeing that UAA mugged our team up and down the ice for 65 minutes on Saturday night. That was a nice touch on your team’s part. Tackling off the face-off? Wowza!